I have done a couple months of analyzing brand fan counts and seeing how brands attract fans through different media buys and social outreach. What I haven’t done, until now, is examine how they engage fans once they have attracted a considerable audience. I looked at five brands that have roughly the same number of fans (47,608 – 66,331.) I was expecting some similarities in how these brands engaged with fans, but instead found five very distinct forms of engagement. No one was applying the same communication strategy which makes this analysis more of a look at different approaches with only a single example of each approach. It's also important to note that this analysis is only one month of data. There may be different levels of engagement from brands based on when they have more or less news to share. I figured the past month was interesting because of so many industry events giving brands lots to talk about. There was the public days of the Los Angeles Auto Show (media days happened 12/2-12/3), Consumer Electronics Show (CES), and the first day of the North American International Auto Show (NAIAS) during the period analyzed. The other thing to note is that the two measurements I use, Engagement Rate and Post Rate, may not be the goals of a brand's Facebook strategy. For example, communications may have more to do with communicating information from stories or videos instead of just fostering comments through open-ended status updates. The post rate looks at how many posts a brand made in a given month and divides that number by 31 days, since I only took a last month view of the post rate (12/11/09 – 01/11/10). The post rate could be higher than normal because of three big events and how brand’s promoted their news in the month. 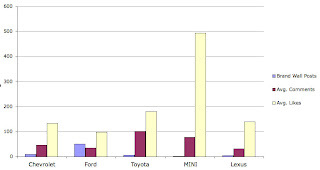 Ford was by far the most active in communicating news and events around the three major events, especially considering how the Ford Fiesta made its U.S debut, MyFord/MyLincoln technology premiered, and the 2012 Ford Focus had its global reveal. A lot of communication happened during this one-month stretch for the brand. A total of 51 wall posts for Ford with Chevrolet coming in second in posts at 10 – a significant difference between the top two engaging brands that were reviewed in this analysis. For Engagement Rate, I utilized a method applied by FrozenFrogs, a digital & emerging media agency. I modified their formula a bit to show how engaged the fan base is, on average, with content posted by the brand, but instead of dividing by days it divides by number of a fans a fan page has to get to a rate of engagement activity. Is It Quality vs. Quantity? Ford takes an approach of a lot of content, at least in the busy past month. Sometimes several wall posts were in the same day; though, this rarely happened, it did happen on big event days like the auto shows and CES where there was a lot to promote. What the data shows is that heavy frequency may decrease engagement activities (i.e. comments and likes.) What the data does not show is do people get the message from the communication, for example click the links to read more if a communication is say a link to a story? Also, collective engagement in a single day may be greater from three stories than say just posting one story. Chevrolet looks like it is either well balanced in engagement activities on a post or they keep getting the same people responding (I checked and it’s not the latter.) Like Ford, Chevrolet posted stories on its wall that linked out to articles or videos. Their highest engagement came from just wishing their fans a happy holidays, something Toyota and Lexus both learned too on their pages. The stories from Ford and Chevrolet are not lacking in quality; rather, the difference in engagement activity may have more to do with frequency of posts. Ford at 51 posts and Chevrolet at 10. 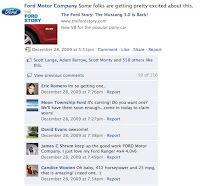 Ford’s quantity netted an overall 6,731 comments and links versus Chevrolet’s 1,791 total comments and links. So while per story engagement was low for Ford, the brand had 275% more activity than Chevrolet. It’s no surprise but vehicle stories performed the best. 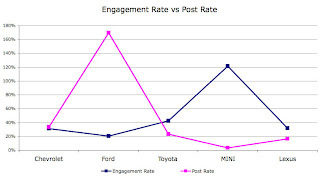 Chevrolet’s Camaro and Aveo RS posts did very well, as did the Ford Mustang 5.0 story which was the best performing wall post across the five brands analyzed with 674 engagement activities. MINI did very well too with their only post for the month on the Beachcomber concept with 571 activities. As mentioned briefly above, wishing fans a happy holidays or New Year also lead to considerable engagement; though, here we have to wonder if the engagement has much value since it does little to get the fans informed and motivated about the brand’s products or services. It does do one positive thing and that’s get the community talking which will lead to activities done by a fan to show up on their news feed in Facebook which may attract their network to a brand’s fan page. Toyota had 7 wall posts in the month reviewed and 5 of the posts were just text status updates asking fans what their holiday driving plans are to what their New Year’s resolution is. Status updates do generate a lot of engagement activity, since the examples here used open-ended updates to spark conversation. 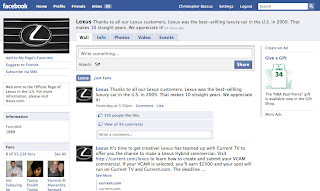 Other brands shared Public Relations stories or product stories on their pages. We’ve already discussed how product stories generate a high response, but it’s important to note that it didn’t really seem to matter if posts were stories or videos or if they were from the company itself or links to a trusted news source like the New York Times. Though to be clear, it didn’t matter as far as engagement on the Facebook page went. What we don’t know is if links were clicked on more or less if sourced from the company or a trusted news source. MINI was the biggest surprise to me when pulling this analysis together. I expected the darling of consumer engagement and fun marketing to be a bit more charismatic on their fan page. Oddly enough there was just one post from the brand. MINI promoted its concept that debuted at NAIAS. There was not even a Happy Holidays status message. Maybe it was a slow month for MINI, but they had a couple things I found on Google they could’ve shared with their fans like their box art ad that many bloggers discussed and liked. Or even more fun and consumer focused, someone posted on eHow an article on cleaning the interior of a MINI Cooper. There really isn't enough data to draw any major decisions or insights from this "glimpse" into one month of data. What it does show is how several major brands used their Facebook fan pages during a month of major automotive events and how their fans responded. It is interesting to look at how brands are using the medium and what is resonating with fans. Topics, not medium of content, is what gets people talking. New vehicle information, especially about sports cars, and articles about fan favorites like a company leader fans resonate with (yes, I'm talking about Alan Mulally) do get people engaging with page content. What I didn’t discuss here is the content fans posted to the pages. There was a ton of it from all brands. Maybe some other evening when my wife is out at dinner and shopping and I’m home alone with my laptop and nothing on but American Idol I’ll do some analysis of what fans are posting and how that fosters engagement. For now, I hope you enjoyed this glimpse of fan engagement in the automotive space. Disclosure: I do work for the Agency of Record for Ford Motor Company. I am not directly involved with the Ford brand page's Facebook strategy. The data I looked at in this analysis is information anyone could have put together by just simply looking at fan pages - i.e. all data is publicly available. Also, this isn't a look at whether Ford's Facebook page is working or showcasing it as a model of success; rather, I'm just looking at 5 brands with roughly the same number of fans and how they engage their fan base. The numbers you cite are insignificant. You need a few hundred posts just to have enough to begin analysis. I completely agree and that's why I pointed out at the beginning of the article that it only looks one month of data. It's also why I named the post "A Glimpse..."
However, it is interesting to see how several brands did communications on Facebook during a very busy month of automotive news and major events and that is what I "analyzed." I definitely agree though that one cannot draw any conclusions from a long-term understanding of engagement, but that is stressed throughout the article. Also note I made a change in the summary to further stress the point because it is very important. yes now we have a choice the automotive products of different-different brand ,the quality of the vehicles are now improving.